Police are investigating after a man was found dead in the toilet of a pub in Ayr. 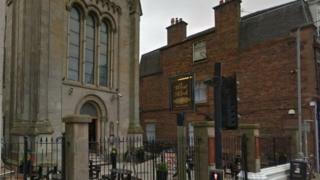 The man's body was reported to have been found by a cleaner at the West Kirk pub - a former church owned by Wetherspoon - at about 08:40 on Saturday. Police Scotland said there were not thought to be any suspicious circumstances. A Wetherspoon spokesman said the discovery was a shock to staff. He said: "We can confirm that a man's body was found in the toilet at The West Kirk pub in Ayr. "We pass on our sympathy to the family and friends of the man. This was also a shock to all of the staff at the pub. "We will assist the police in any way we can." A Police Scotland spokeswoman said: "Around 8.40am on Saturday, police were made aware of a man's death at a premises in Ayr. "A post-mortem examination will take place in due course, however there are not believed to be any suspicious circumstances."